Cyrus Duffleman is an adjunct university professor fighting to reach the end of what seems like the single longest day of his life. From dawn till midnight, he sprints amongst four different educational institutions where students test his patience levels–particularly the ones with a raging sense of entitlement and blind patriotism–and where tragedies such as suicide and murder go down. In the rare moments when Duffleman does catch a breather, he can’t help but stress about his financial limitations, school administrative bureaucracies, and on a more personal level, crippling loneliness, which emerges in his daydreams of what-if scenarios. Despite the stressors and personal doubt, Duffleman never ceases to put his full effort into his work and his heart into the community. He tutors students for minimum wage, often gives away his last few dollars to those he feels need it more, and at the very end of his long day, he helps end a domestic terrorist attack. 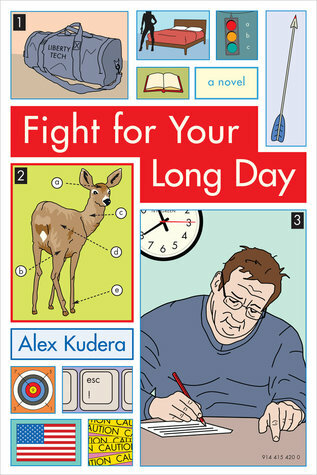 An author with a phenomenal writing ability, Alex Kudera has written a powerful debut novel about perseverance, and seeing through not only work but life commitments with dignity, respect, and most of all, unyielding passion.